Click to viewA new high-speed X-ray video camera, now the fastest in the world, can see through molten metal and watch weld-weakening flaws form in real-time. Take a look at sample footage from the device. The $670,000 device successfully captured X-ray footage on Nov. 23 at 5,000 frames-per-second (fps), or five times faster than previous X-ray cameras (and 83 times faster than a consumer camcorder). The high-speed video above shows a laser welding solid aluminum in visible light, followed by the new X-ray-light welding clips. "With visible light, we could only see the surface of the welding process. You couldn't see what was happening inside," said Felix Abt, one of the camera's designers at the University of Stuttgart. "The only way to see pores that weaken weld seams was to cut the metal into pieces." Automotive companies use robots equipped with high-powered lasers to seam cars together with extreme speed and precision. As laser welding continues to get "more powerful, move faster, go deeper" and increase in use, Abt says, it's increasingly important to understand the dynamics involved. "Laser welding creates very high-pressure, high-velocity, fluctuating environments. You're boiling metal that's cooling almost instantly," Abt said. "This leads to instabilities that weaken your weld." To capture the welding process in action, Abt and his colleague Rudolph Weber use an industrial-strength 4-kilowatt laser, which is roughly 400,000 times more powerful than a DVD drive's beam. As their laser pummels a hunk of metal moving on a track, a cathode fires X-rays through the weld and toward a high-speed video camera. 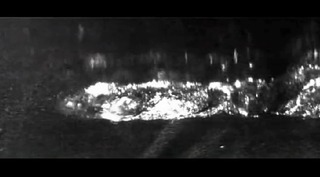 As a frame of reference, the first clip shows 10,000 fps visible light footage zoomed in on a small 10-by-5-millimeter frame. The fuzzy 1,000 fps and 5,000 fps clips that follow are the new ones filmed in X-ray light. "The white structure on left is where the laser hits. That's a capillary of metallic steam," Abt said, noting aluminum boils at 4,400 degrees Fahrenheit. Whitish globules that break off the capillary are weld-weakening pores that become invisible as they cool, typically in a matter of microseconds. The new X-ray footage isn't pretty, Abt says, but in a few months he and Weber will tune the camera to increase its clarity. They also plan to imbue welding samples with tracer materials, such as tungsten carbide, that emit X-rays at high temperatures. "This is really only the beginning, but we now have the ability to watch processes that lead to porosity in real time while we're welding," Abt said.